Going beyond the joy of winning the two first prizes in the recent Innovative and Creative Startups Contest (ICSC), the story of Xua has touched our soul with the delicacy of a young person, who has leant on the tradition to walk to the future. 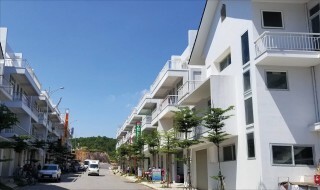 Xua is the shortened name of Xua Production, Trade and Service One Member Co. Ltd., located at Block M52 of the new urban area of South East Thuy An, Thuy Duong Ward, Huong Thuy Town, Thua Thien Hue Province. It is managed by Nguyen Ngoc Quynh Anh, a young woman with a charming face and a conversation style which are more youthful than her age of 32. Being born and having grown up in Hue, yet Quynh Anh had once lived and engaged in small trades under the sky of the distant Europe (Czech Republic). 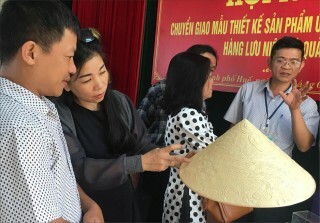 Prior to taking part in the ICSC, the small family of Quynh Anh had moved permanently back to Hue, and her company has just been founded for 2 months. 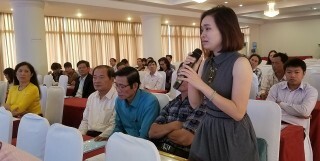 With broadened markets, proficient human resources and an effective business model, the project “Applying traditional handicraft techniques into fashion footwear production” of Xua concurrently won two first prizes of the ICSC 2018 whose competitors are enterprises in Thua Thien Hue Province and Central Highlands of Vietnam. 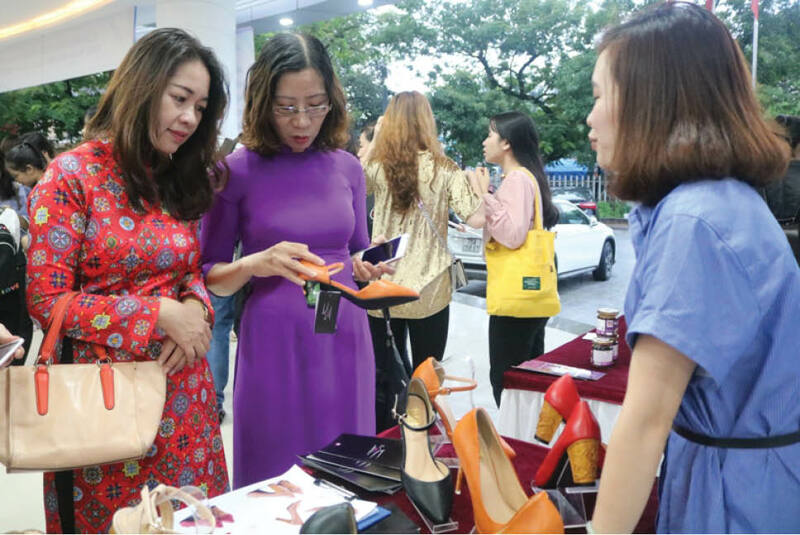 Quynh Anh’s idea of starting up from fashion footwears in combination with traditional arts and crafts came from the clogs of a friend of hers. When she used to go back and forth between Vietnam and Czech Republic, Quynh Anh was fond of buying traditional handicraft products from her homeland as souvenirs to give her close friends abroad. There was a time when a friend of hers received a clog as a gift from Quynh Anh, and she wore it every time she went out. However, after a little while, Quynh Anh did not see her wearing them anymore. She was then being told that the clogs were not safe at all when being used in rainy days, as they had caused her friend to fall down and hurt herself many times. The images of her friend’s clogs had been going around Quynh Anh’s mind. An idea then triggered her mind that while Ao Dai – the traditional gowns of Vietnam has been successfully and gorgeously modernized, why not give clogs a try. Being enchanted by that thought, she got to work by applying traditional arts and crafts to modernize the heels of fashion shoes. “There are many skillful masters and workers in Hue, but they choose to develop their career in big cities. 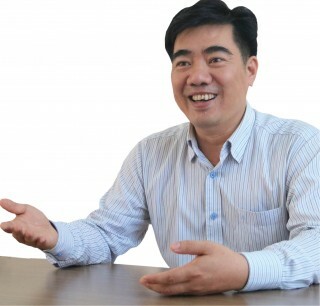 Inviting them to return to Hue to work is not a simple question for Xua. 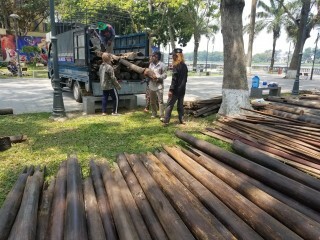 For some high-ranked and skillful workers who are staying in Hue, they tend to keep a low profile and it is not easy to collaborate with them in the new mode of work. However, with persistence, and a little bit of luck, Xua has found precious collaborators who have ability, responsibility and passion at the same time”, shared Quynh Anh. Leaving such difficulties behind, Xua has currently magnetized the interest of its targeted customers, those who go for high-class and unique products. “Xua is strong at designing. While the uppers of the shoes are fabricated with machine assistance, all the heels are 100 percent hand made. 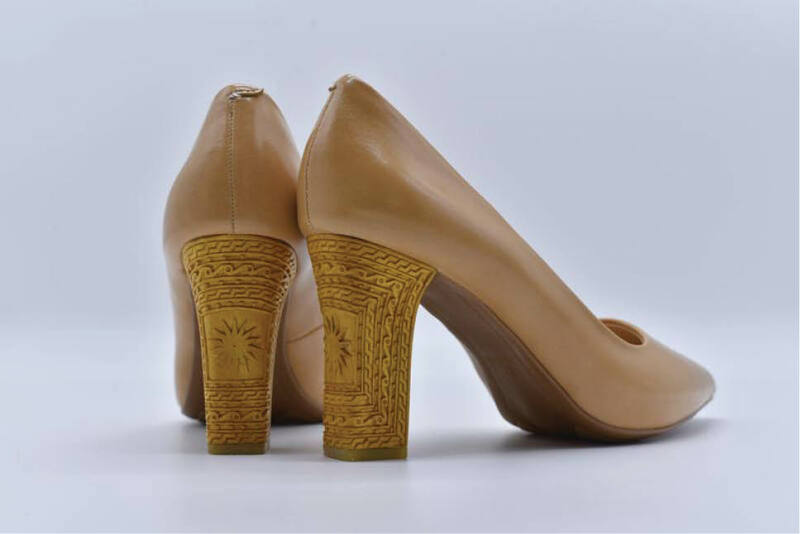 After being shaped from jackfruit and “muc” (Wrightia annamensis) wood, the heels are embellished with carving, mosaic and lacquer techniques. The decorated patterns are inspired with lotuses, traditional Dong Son bronze drums, and royal culture etc. We are going to simplify the carving patterns and work so that the products’ price could be lowered. In the meantime, we also update our products with the new fashion trends, including both patterns and colors, to ensure that the products are made simple yet elegant and not out of date,” Quynh Anh shared proudly. 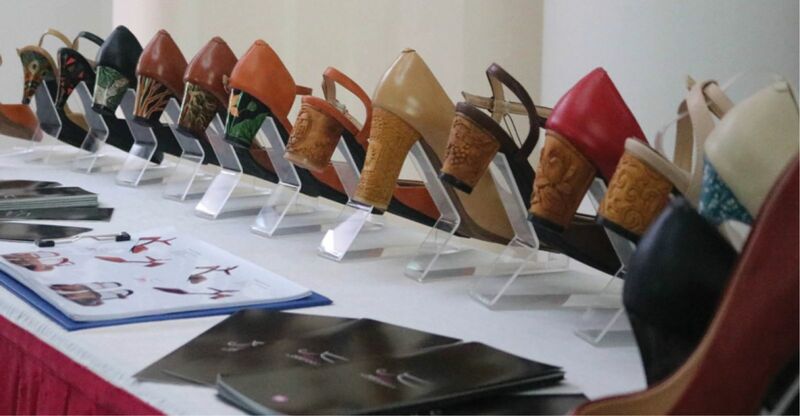 At the ICSC forum, Xua’s project “Applying traditional handicraft techniques into fashion footwear production” is highly evaluated in many aspects. Xua is a fully-mature startup, having its own market and a business strategy, and has built up a stable distribution network. Xua has made itself outstanding and different as their products are suitable to the demands of the markets of medium and high users. In each of such footwear products, they know how to elaborate the value by bringing the east and west elements together. The heels, the unique feature of the products, are completely made by hand with traditional techniques of Vietnam. To some extent, perhaps choosing Hue to be a place for a startup is somewhat going against the principles of risk minimization in investment. However, Quynh Anh has showed that she has enough confidence to pursuit her dream right in the land of Hue. With locally available materials, skillful, earnest and passionate co-workers, Xua’s products possess many advantages to compete and thrive in the market. Currently, the prices of Xua’s products range from one to five million VND per pair, in which the lowest are the lacquered ones. The manager of Xua shared that “The prices have been “forced down” a lot so that more and more females can afford to buy. What makes the handmade heeled shoes valuable is that they are unique and take a lot of work of mind and hand from the craftsmen. If customers can recognize this, they would fully perceive the value of the products that they select”. Aiming at export markets, from the beginning Xua has tailored its product quality in accordance with European criteria. The business experiences in many years in Czech always remind Quynh Anh on product quality. It is not also about accepting the rules of the game in the foreign arenas, but also about establishing her own brand and prestige. Therefore, every Xua’s products must be ensured to be able to last in use in two years before getting to the hand of customers. Furthermore, before sailing into the big seas, Xua has known that it has to firstly stabilize its trade mark in Hue and gradually expand to the big cities in the country. Xua determined that this serves as a prestige “ticket” to get through the export gates. “Possessing such a lot of exceptional values, what does Xua need to do to counter fake products?”. The manager answered with a smile, “Xua brings its products to the market with a confident mind. They are not the products of a single individual, but the resonance of many skillful craftsmen and of those who share the same passion and sense of purpose. As the heels are uniquely made; there are many meticulous details that could not be done by machine. Therefore, if someone wants to counterfeit, they must have the same good men like ours. In some foreign countries, there may be many skillful craftsmen, but their products price could not compete with ours for sure then”.